Introduction: Mesenchymal stem cells (MSCs) are possibly the most potent type of stem cells for the treatment of many diseases since they possess many advantageous properties, such as abundant source, ease of isolation, and potential to differentiate and trans-differentiate into different types of cells. Although the therapeutic potential of expanded MSCs has been well proven, their biosafety features have not been fully understood. This study aimed to investigate some changes in phenotype and gene expression of bone marrow derived MSCs after long term expansion. Methods: In this study, expanded mesenchymal stem cells derived from human bone marrow (hBMSCs) were identified for their characteristics (which included morphology, immunophenotype, and differentiation potential) at passages 5, 10 and 15. Moreover, they were evaluated for the expression of various tumor suppressor genes (PTEN, p16, and p53) by real-time RT-PCR. Results: The results showed that the hBMSCs at passage 15 displayed a change in morphology and a slight reduction of the expression of CD44 and CD90, whereas their potential for adipogenic and osteogenic differentiation was maintained. Moreover, the expression of tumor suppressor genes in the hBMSCs increased after long-term culture. Conclusion: It could be assumed that prolonged cultures of more than 15 passages drove the hBMSCs into senescence phase. Cultured hBMSCs below passage 10 seemed to be more effective in application because their properties were still preserved. There have been a remarkable number of research studies and clinical trials of mesenchymal stem cells (MSCs) in recent years. MSCs have shown therapeutic effects for several diseases, including graft versus host disease (GVHD), heart failure, chronic spinal cord injury 1 , diabetes mellitus 2 , 3 , and even cancer 4 . While MSC-based therapy represents a potentially valuable and potent application, the biosafety of MSCs, particularly of expanded MSCs, has not been well-studied. Long-term in vitro cultured MSCs are assumed to enter a senescence phase after approximately 20 doubling populations 5 . They may bypass the senescence phase and continue to divide until they enter the crisis phase, followed by cell death 6 . Some of the MSCs may bypass the crisis phase and become transformed cell lines 5 . Phenotypic and cytogenetic methods are used to evaluate cell senescence and transformation; moreover, changes in gene expression and DNA methylation are also employed 7 . Transformation of human cells is assumed to be associated with gene expression changes, particularly of genes involved in telomerase activity, tumor suppressor genes, and those related to activation of oncogenes 8 . Long-term expansion of human MSCs is thought to decrease therapeutic efficacy due to the reduction of the MSC properties 9 , 7 . To identify the alteration of human bone marrow-derived MSCs (hBMSCs) after prolonged culture, this study evaluated the changes in MSC characteristics, including morphology, the potential of mesoderm lineage differentiation, and the profile of MSC surface markers as well as expression of certain tumor suppressor genes ( p16 , p53 , and PTEN ). This study will provide further knowledge in the understanding of the properties of long-term cultured MSCs. The findings will impact the basis of cultured MSCs in research and clinical applications. The human bone marrow-derived mesenchymal stem cells (hBMSCs) were provided by the Laboratory of Stem Cell Research and Application, VNUHCM University of Science. The cells were cultured according to a previously published protocol from the laboratory 10 , 11 . Briefly, the cells were thawed from liquid nitrogen (-196 o C) and cultured in MSC Cult medium under the condition of 37 o C, 5% CO 2 in an incubator. When confluency was reached, the cells were passaged and continuously cultured in fresh medium. The cultured cells were harvested at passages 5, 10, and 15 for use in experiments. The surface markers of the cultured cells were detected by immunostaining using the following monoclonal antibodies: CD14-FITC, CD34-FITC, CD44-PE, and CD166-PE (BD Biosciences, San Jose, CA, USA), CD73-FITC, and CD90-FITC (Santa Cruz Biotechnology, Dallas, TX, USA) for 30 minutes. The cells were washed with FACS buffer after that, and then suspended in sheath fluid and analyzed using a FACS Calibur flow cytometer (BD Biosciences) with CELLQuest software (BD Biosciences). The hBMSCs were induced to differentiate into adipocytes and osteocytes in the adipogenic and osteogenic medium, respectively, for 21 days. The adipogenic medium included low glucose DMEM/F12 supplemented with 10% FBS (Thermo Fisher Scientific, Waltham, MA, USA), and 1% antibiotic-antimycotic, 1 mM dexamethasone, 0.5 µ M 3-isobutyl-1-methylxathine (IBMX), 200 µ M indomethacin, and 10 ng/mL insulin (all reagents were purchased from Sigma-Aldrich, St. Louis, MO, USA). The osteogenic media included low glucose DMEM/F12 supplemented with 10% FBS, 1% antibiotic-antimycotic, 50 µ g/ml AsAP (apoptosis- and splicing-associated protein), 0.1 µ M dexamethasone, and 100 mM β - glycerophosphate (all reagents above were obtained from Sigma-Aldrich). The cells were plated at 10 3 cell/cm 2 in the induction medium. The medium was changed every 3 days. After 21 days of induction, the cells were stained with Oil Red O or Alizarin Red to identify lipid droplets or mineralized matrix content, respectively. The expression of tumor suppressor genes, such as p16 , p53 , and PTEN , were evaluated by quantitative reverse transcription PCR (qRT-PCR). At first, total RNA was isolated from hBMSCs using Easy-BLUE Total RNA Extraction Kit (iNtRON, Republic of Korea) following the manufacturer’s protocol. RNA concentration and purity of RNA were determined by the BioPhotometer Plus system (Eppendorf, Hamburg, Germany). Then, RNA levels were evaluated by LightCycler480II machine (Roche, Basel, Switzerland) using qPCRBIO SyGreen 1-Step Lo-ROX Kit (PCR Biosystems, UK). The mixtures were set at 45 o C for 10 minutes in reverse transcription reaction and then heated at 95 o C for 2 minutes. Amplification was performed for 40 cycles of 95 o C for 5 seconds, followed by 60 o C for 20 seconds. GAPDH was used as an internal standard and the relative expression of selected genes was determined using the ΔΔCq method. GraphPad Prism 6 (GraphPad Software, Inc., La Jolla, CA, USA) was used to analyze the data. Statistical significance was defined as P < 0.05, and results were analyzed by Student’s t -test and one-way ANOVA. The MSCs from human bone marrow were thawed and cultured in fresh medium in a 37 o C, 5% CO 2 incubator. The cultured adherent cells were let to proliferate until passages 5, 10, or 15. Then, the cells were characterized for their MSC properties, such as morphology, expression of typical surface markers, and potential for differentiation into mesodermal lineage cells. Figure 1 . Representative images of cultured hBMSCs with altered morphology at passages 5, 10 and 15 . Scale bar = 200 µm. The hBMSCs at passage 5 displayed the typical fibroblast shape, which became gradually smoothened after long-term culture or expansion (passages 10 and 15). At the late passage (P15), the border of cultured cells was observed to be different ( Figure 1 ) . Flow cytometry (FCM) analysis demonstrated that the hBMSCs at all three passages expressed the typical MSC markers, including CD44, CD73 and CD90, with greater than 80% of the cells expressing these markers. Conversely, less than 10% of the cells expressed the hematopoietic cell markers, CD14 and CD34. Moreover, the results of the differentiation assays demonstrated that hBMSCs maintained their potential of osteogenic and adipogenic differentiation after long-term expansion (passages 10 and 15). Figure 2 . Surface marker expression of hBMSCs at passages 5, 10 and 15 . The hBMSCs at the three passages showed a high expression of CD44, CD73, and CD90. On the other hand, CD14 and CD34 were expressed in all passages by about 10% of the hBMSCs. Figure 3 . Differentiation assay of hBMSCs. ( A ) Osteogenic differentiation: the inducedcells positive with Alizarin Red stain after 21 days in the osteogenic medium.Red staining represents the mineralized matrix of differentiated cells; scalebar = 50 µm. ( B ) Adipogenic differentiation: the induced cells positive with Oil Red O stain after 21 days in the adipogenic medium. The lipid droplets with the red color represent the differentiated adipocytes; scale bar = 50 µm. To identify the changes in the expression of tumor suppressor genes in long-term cultures of MSCs, we analyzed p16 , p53, and PTEN . In the quantitative RT-PCR results, we found an increased expression of p16 , p53 , and PTEN in hBMSCs at passage 15. Moreover, p16 and PTEN were expressed at passage 15; the hBMSCs were approximately 4-fold greater than those from passage 5 (hBMSCs), whereas p53 was upregulated more than 11-fold. Meanwhile, there was no change in the expression of p16 , p53 and PTEN levels between hBMSCs at passages 5 and 10. Figure 4 . Prolonged cultures enhance the expression of tumor suppressor genes of human bone marrow-derived mesenchymal stem cells . 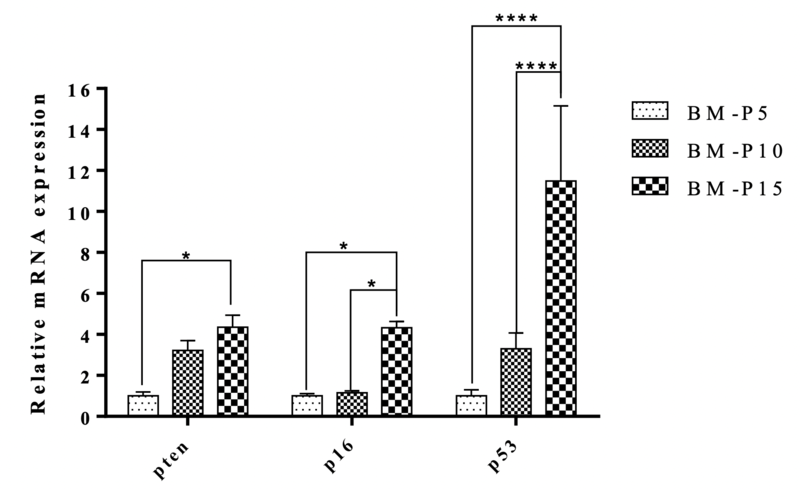 Relative expression levels for PTEN, p16, and p53 were assessed using the Livak method. Data shown are comparable to an internal control (GAPDH), with fold change compared to expression levels in hBMSCs at passage 5 (set to 1). Statistical significance was set at p<0.05. Bone marrow-derived mesenchymal stem cells are promising multipotent cells that are being widely used in many clinical applications, such as for the treatment of degenerative tissues, graft-versus-host disease, and autoimmune diseases 12 . For clinical applications, the human MSCs are isolated, culture and expanded ex vivo to obtain a large number of cells. According to the International Society for Stem Cell Research (ISSCR), the expanded MSCs should be checked for their biosafety and effectiveness prior to use in clinical trials. These issues are related to the integrity of the MSCs, including their “stem cell” characteristics, chromosomal stabilities, and their status in in vitro expansion. In this study, we evaluated the changes in hBMSCs with regards to their morphology, immunophenotype, the potential for adipogenic and osteogenic differentiation, and expression of tumor suppressor genes p16 , p53 and PTEN . It was found that the hBMSCs had the typical morphology of spindle-shaped MSCs at passage 5 and gradually became enlarged and flattened until passage 15. The altered appearance of hBMSCs suggested that they underwent a senescence phase during the in vitro culture 7 , 13 . The FACS analysis reinforced that aging hBMSCs had a reduction in the expression of CD44 and CD90 (95% and 99%, respectively, at passage 5, compared to 81% and 92%, respectively, at passage 15). The down-regulation of CD90 was documented in cells at the senescence or crisis phase 14 , 15 , 13 . Even when the MSCs transformed, they expressed low levels of CD90 and were negative for CD105 15 . The CD90 - phenotype of transformed MSCs was also described in a previous publication 16 . Furlani described that the transformed or abnormal MSCs, after long-term culture, were devoid of CD44 and CD90 and showed diminished therapeutic effects 9 . 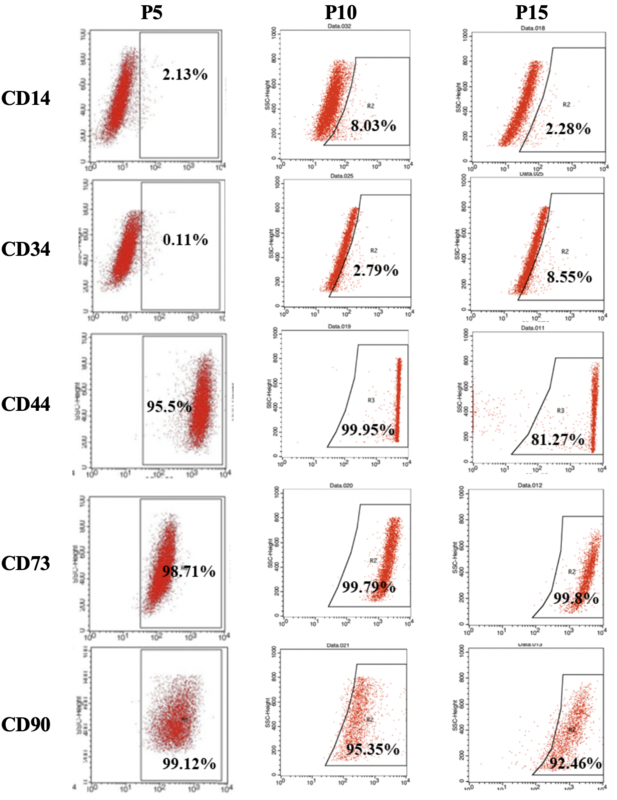 Although our cultured hBMSCs at passage 15 displayed the senescence status, there was a relatively high proportion of hBMSCs (greater than 80%) expressing positive markers like CD44, CD73, and CD90; a low proportion (about 10%) of the cells expressed the negative markers, such as CD14 and CD34. The hBMSCs at passages 5, 10 and 15 were able to differentiate into adipocytes and osteocytes. Therefore, the hBMSCs maintained their differentiation potential into mesoderm lineage cells after in vitro prolonged expansion. The same observations were noted in long-term culture of human umbilical cord-derived MSCs 17 , human bone marrow-derived MSCs 15 , and human adipose-derived MSCs 13 . The lifespan and status of in vitro long-term cultured MSCs could be predicted by the expression of pluripotent markers, such as OCT4, tumor suppressor genes, such as p16 18 , p53, and PTEN 8 , and oncogenes, such as MYC and RAS 8 . P16, p53 , and other tumor suppressor genes are assumed to be senescence-related genes; their expression is induced after long-term expansion 5 , 19 , 7 . The low p16 INK4A expression together with high OCT4 gene expression represents the robust in vitro proliferation of MSCs 18 . Moreover, the expression of p16 can be down-regulated so that the MSCs are free from the senescence state in hypoxic conditions or cultures 20 . The loss or depletion of p53 can induce tumorigenesis 21 or generate mutated and spontaneously transformed hBMSCs 12 , whereas the up-regulation of p53 can induce cell senescence 7 . In our study, the results indicated that the expression of p16 , PTEN , and p53 increased 4- to 11-fold in hBMSCs at passage 15, compared to those at passage 5. The findings concur with the results of altered morphology and reduction of CD90 expression described above. Our study demonstrated that hBMSCs could display signs of senescence after 15 passages of culture, changes in cell morphology, changes in expression of CD44 and CD90, as well as changes (increase) in the expression of p16, p53 , and PTEN . However, the hBMSCs maintained the potential of adipogenic and osteogenic differentiation. Meanwhile, there was no change in the hBMSCs between passage 5 and passage 10. It is suggested that the expansion of hBMSCs not surpass passage 10 in order to avoid the reduction in quality of the cultured cells. These results require further studies to better understand mesenchymal stem cell biology in vitro to confirm the safety of the stem cells. This will critical prior to applications of the stem cells in clinical treatment or in the development of optimal culture methods for stem cell production for research and application. LTTD: designed the study, performed the experiments, analyzed the data and wrote the paper; PVP: designed the study and revised the paper; ATVB, HDV: performed the experiments and analyzed the data; NCT: performed the experiments and reviewed the paper.